As I tell you I will keep you up to date with "PENetwork Manager". Maybe on sunday I have finished it so far for publishing. It's looking good and it's a quick way to add shares, does it detect all drives or do we have to manually add them on the list? Long time ago I wrote this Reatogo plugin. If there is interest, I can try to adapt to WinBuilder (Or rewrite in Delphi). Very interesting work Peter - I find it very usefull. I have a fileserver which depends too much on file shares (over 70 users with specific permissions), your program would surely automate a boot disk to replace the broken OS when it fails and quickly ensure a file server until it gets fixed - or even replace it completely - who knows? I was just using it because I need to share files using Active Directory on our Domain. Add these lines to %ProjectDir%\WBverify.ctl and the project will tell you about possible issues! Updated: see first post for further details. In trying to to test the File sharing section. I started from top. I tried to press the Start button. It told me that i needed a username and password. So in this test I used username for username and password as password. Then I pressed the Start button again. But it gets stuck at the Stopping File Sharing Service. So at this point there is no way to Cancel or stop PENetwork gui and starting over. The only way to stop it is by using the Task Manager. Afte killing the gui with Task Manger and restarting the "PeNM" using the shortcut. I see the following things being shared, even when I did not see them before. mmm! Seeing that it says File Sharing is running I try to browse to the Workgroup and then tryo open it to see the shared drives or folders but I get the following error. I like the minimize option. Internet connection is still working on this version XP source. I can still print a PDF file. I think I had the same situation with the start sharing but thought it was just a temp.problem. 1. Automatic start works normally. 3. Network browsing from My Network places doesn’t work. At the moment I have no idea how to get this "network browsing" work correctly. I see why this would be very usefull. Good idea! "My Network Places" can be browsed when the 'Explorer Shell Tweaks' script is included in the build. Updated - see first post. Note: network browsing does not work in QEMU by default cause of the buildin firewall. I read some facts the last days (TAP, ect.) and will try some things to also support it. P.S. : if nobody disagree I would also implement the new version into the 067-LiveXP-project by default. Just tested with the latest buildmodel from Peter and your new version - both worked flawlessly! Network started automatically - in a very clean and professional way. After this step was finally able to browse the web, the tray icon is very well placed - can it also display some network activity to display an active/inactive state just like network connections? Just and idea - it works just fine as it is!! I would suggest this myselft because the old one included with LiveXP does not work within Qemu, Vmware, Virtual PC. It doesnt recognize the network card. This time it seemed to auto start fine and go to the tray. When you open it from the tray by double clicking you get the main window. When you click on the minimize button the Window is not minimized to the tray area. Instead it goes to the taskbar instead. When I try to start the File Sharing everything seems to start properly this time. It doesnt seem to get stuck at the point it did before. Is there going to be an option to not have to provide a name and password. I was trying to get to the shared folders under Qemu but after a bit I remembered you said qemu had an active firewall at the moment so we shouldnt expect to get to the shares. Similar results. Started fine and it went to system tray. It saw network card. Inputed name and pass and started Sharing. No problems there. Yeah! i really dont like when I click the minimize button that it does not go into the system tray. 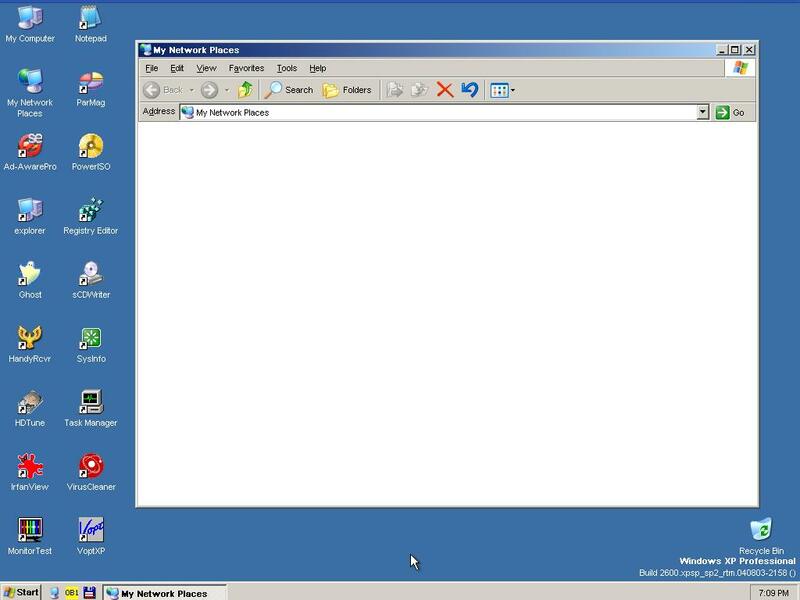 Double click system tray icon to open the PENetwork Manger. Right click on System tray icon and also get the option to Exit program. You dont need running in system tray for things to work. right! At this time you have to double click on the minimize taskbar window to send it to the tray. 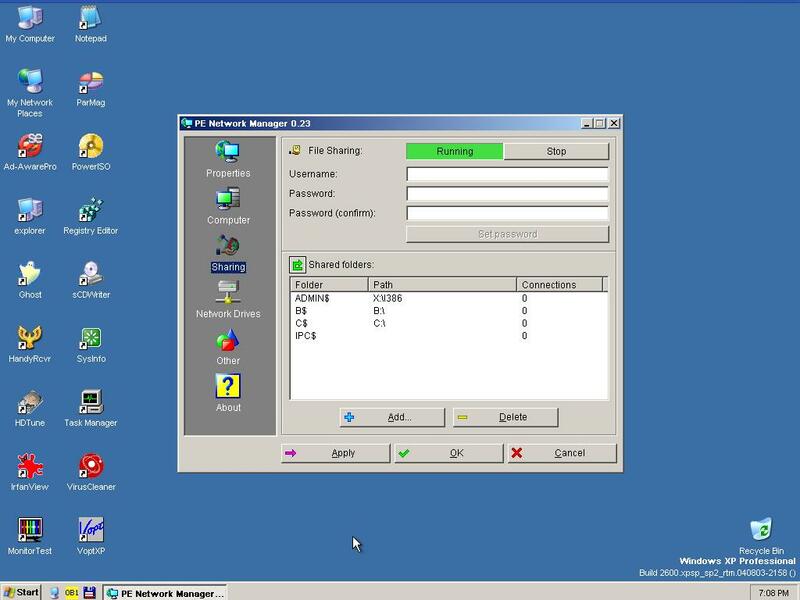 From my real OS i can see the name "Minint" for the Vmware Virtaul LiveXP. I click on it to login but I get the following screen. In my User name it suppose to be username for this test. Password is the password. Im not given the option to put the user name and password in the real PC to connect. When I browse to the minint within the LiveXP CD I can see the Shared Minint but I cannnot see the Shared drives in the list. Workgroup even though I dont have it set with password and username on the real PC. Further testing. When I click on the add button an select the C drive and add it. I can see whin the Workgroup of Vmware. 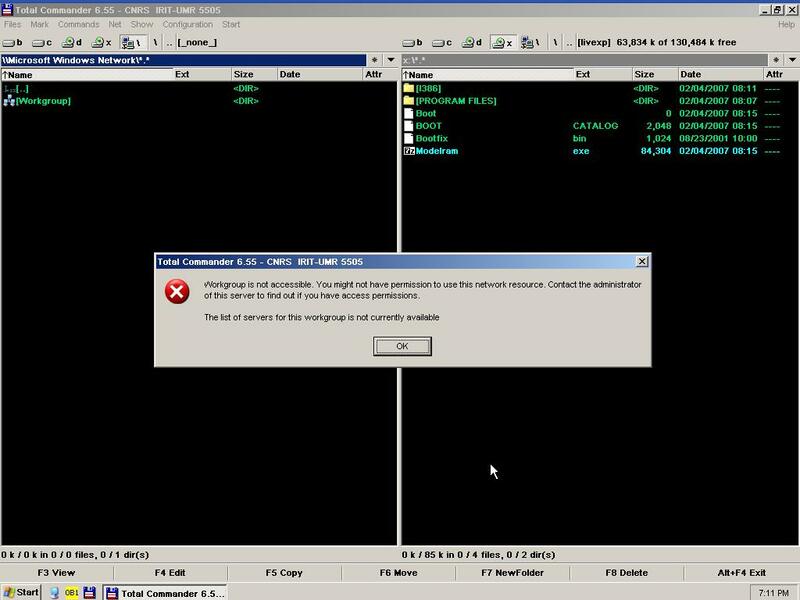 Still from the real PC I cannot get access to the minint within the Workgroup. As stated above were you cannot put a username and pass. This is now very professional solution! 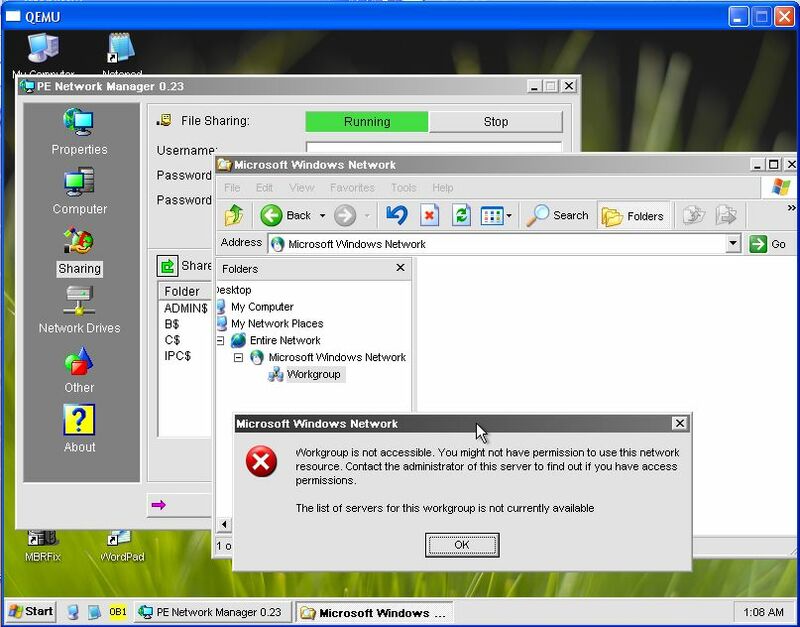 I will test network browsing on a real PC and report. Those shares are hidden, this way you might be able to acess them. That's not a bug of Holgers script. That's a XP bug! There's a way to make XP ask everytime and allow you to enter data, but can't remember how, right now. XP thinks it has already the login data, so no reason to allow you to reenter them. Why then does it display the dialog at all? Think this behaviour had something to do with a setting called something like 'easy sharing' in english. It's in the explorer settings. I'm currently not interested in sharing my PE to the outer world. In my opinion I want to use the PE as an emergency tool. Therefore it is not necessary that the network has access to my folders. For me there is another issue. Maybe it is not yet solved in this beta state, maybe I do something wrong. Ever noticed how much faster network transfer is, when you 'pull' the data instead of 'push'? If you wanna back up huge amounts of data, trust me, you want to have network accessible drives! Well, two points worth testing. - Try the command with the protocol.